Take a brief tour of Money Pilot. The Money Pilot Planner is your heads up display. From here you'll see the total balances of all your accounts. You'll also see how much you have currently due for bills and how much you'll have left over after you pay them. Scrolling a little further down you'll get a forecast of what bills are due in the next few weeks or pay cycles. Each of the Bill areas scrolls horizontally to view each of the bills due for a given week or pay check. Simply tap on one of the bills and you'll be presented with a detail view for the bill to see more information about it or quickly record a transaction into an account that marks the bill as paid. Visit the Bills Page to learn more about Bills & Billers. In the upper right corner on the Nav Bar you'll find a convenient button to quickly add new transaction records to your default account or any other account. In the accounts tab you'll find a list of all your accounts. Tap an account to access all the transactions in the account. Here you can add new transactions and edit or delete existing ones. If you've enabled the Reconciler the current account balance scrolls to the left to reveal the totals for pending, posted, & uncleared debits and credits. These cells also filter the transaction list by transaction status. Visit the Accounts & Transactions pages to learn more about adding, and managing, accounts and transactions to Money Pilot, as well as the Reconciler feature. In the Bills tab you will find a list of all your bills, both paid and unpaid through out the coming year. This is where you create and manage your Bills. You'll also find options to view, edit, and create billers that recur on a wide variety of frequency options or not at all. You can also convert a one time bill to recurring with only a few taps. At the top of the bills list is a side scrolling list of all the recurring Billers you've set up, sorted by the order of bill due dates. With the tap of a finger you can edit every unpaid bill for a biller or delete them all together. Just need to edit one bill, simply tap it from the list below and you'll get a detail view with options to edit the bill, leaving the rest of the bills for that biller untouched. You can also record a transaction into an account that marks it as paid with only a few taps. Visit the Bills Page to learn more. The Pay Days Tab is where you'll find options for creating, editing and viewing Pay Schedules & Pay Days. At the top of the list is a horizontal scrolling view of all your pay cycles. You can enter as many as you wish and Money Pilot will sort all of the pay days and plan your bills around them. Below the Pay cycles is the list of pay days. Money Pilot supports pay cycles on a wide variety of recurrence patterns. 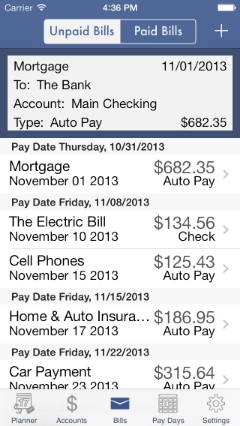 Simply tap a pay day in the list to quickly create a transaction record for it. Visit the Pay Days page to learn more.